Congratulations guys. I hope this victory isn’t short lived. Greetings fellow truck food lovers. We in San Francisco have been watching your battle with great interest. Last year our esteemed Board of Supervisors passed a law banning food trucks within 1500 feet of schools, theoretically in an effort to ensure a “wellness policy” via school lunch programs and enforce the will of the “Student Nutrition and Physical Activity Committee”, a parents group. 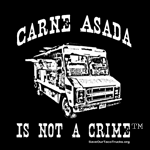 However, this is affecting El Tonayense, a respected and long standing taco truck chain in the Mission.